Disappointment: The name of the game | What's French Cooking Without the Butter? Disappointment is taking out your brand new Kitchenaid Stand Mixer, plugging it in, and realizing that the recipe you are about to make needs to be hand-mixed. We just got the mixer as a wedding gift, and it’s clearly a gift that is more suitable for me than Justin, but I haven’t had a chance to use it. Our kitchen is so tiny that even taking out of its hiding spot is a task. One of my wants for our next apartment is to be able to keep it out on the counter – something that I’m not sure is achievable in New York City. Instead of dwelling on it, I left the mixer on our butcher block and proceeded to make the caramel-glazed honey crisp apple bread posted at Culinary Concoctions. I subbed out the buttermilk and used plain soymilk, with a tablespoon of apple cider vinegar in it. I didn’t bother subbing out the eggs as we still had some from the farmer’s market – but I think that some Ener-G Egg Replacer would have worked just as well. 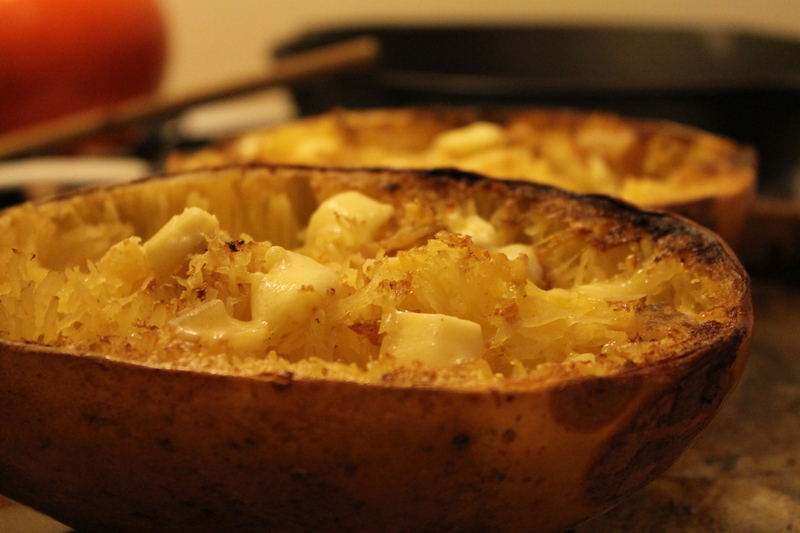 While working on that, I got started on dinner: spaghetti squash. This is one of those occasions where I wished that we had a microwave. It would have sped up the cooking process by eighty percent. I won’t explain how to do it with a microwave because it’s a joke (pierce it a few times with a fork, toss it in the microwave for a few minutes is the basic idea) and depresses me. 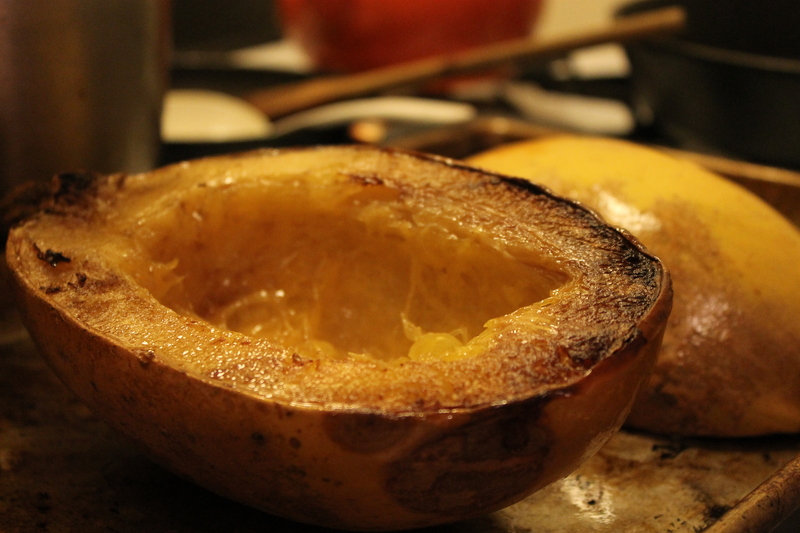 Here’s what I had to do: struggle for five minutes to halve the squash, put it cut-side down on an oiled baking pan, roast at 350 fahrenheit for about forty minutes. At that point I took it out, tried to pierce the exterior with a fork and had to put it back in for another ten minutes. Thankfully I was busy with other things. After two weeks of not really cooking (last week’s big pot of chili that we ate for four days doesn’t really count), I went a little overboard today. While the apple bread was baking, I started on a lima bean-kale soup. I had some carrots and celery leftover from before the wedding that seemed to be on its last legs, so I chopped those up with an onion, sauteed it all for about ten minutes before adding vegetable broth, a large can of lima beans, and then four leaves of chopped kale. When I first started cooking, I used to struggle with how to cook things without a recipe. I didn’t really understand how to guess at how much of a certain item to cook. It’s been a few years of cooking now, and I finally feel comfortable improvising. For those of you struggling with this, just try to think of how much of each ingredient you would like to eat if you were just eating each item separately. So for the soup, I wanted to make about four servings so that we could eat a small bowl tonight and another tomorrow. This meant that I chopped one onion, three cloves of garlic, three carrots, two stalks of celery, and a large (15oz) can of lima beans. I had one large bunch of kale from the farmer’s market, so I used half – about four leaves – that I chopped up and added to it to make it a bit thicker. I added enough water to cover the vegetables and kale, and added two cubes of vegetable broth (vegan with sea salt), and finally seasoned it to taste (eventually adding a little bit of crushed red pepper and chili powder to give it a little kick). I ended up with an easy to make, but great tasting soup. Writing, cooking, and eating in Brooklyn. This entry was posted in Baking, Recipes and tagged apple bread, apple cider vinegar, Baking, cato corner farm, cooking, culinary concoctions by peadbody, dinner, ener-g egg replacer, food, honey crisp apple, kale, kale soup, kitchenaid stand mixer, lima bean soup, lima beans, spaghetti squash, vegan apple bread, vegan buttermilk, vegan cooking, vegetable soup, vegetarian, vegetarian cheese, vegetarian cooking. Bookmark the permalink. 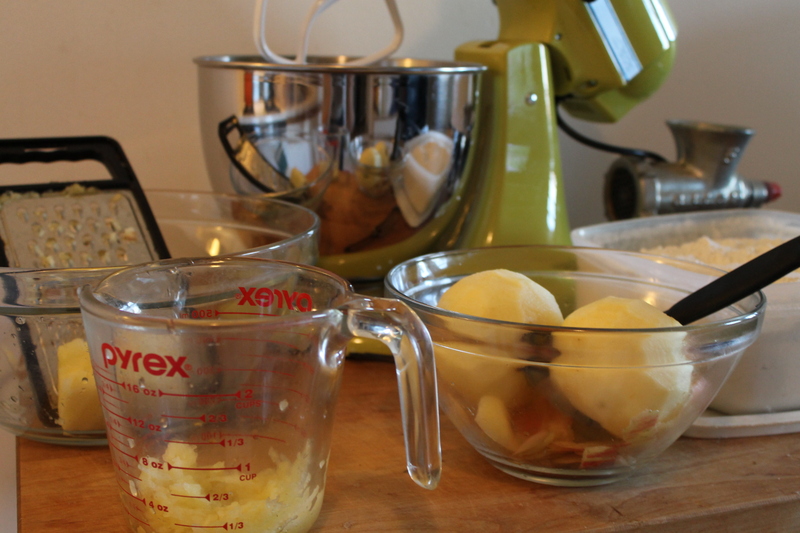 For future reference anything that uses an electric hand mixer can also be done in a stand mixer and vice versa. I totally understand that burning desire to use a new kitchen gadget asap haha. When I first got my kitchenaid i made like four loaves of bread that we didn’t need, just so that i could play with it. I used to have to keep my KA in the closet with our washer & dryer because our kitchen was so small. Whenever I hauled it out, it would be full of lint (but it smelled so fresh!). So I can sympathize!